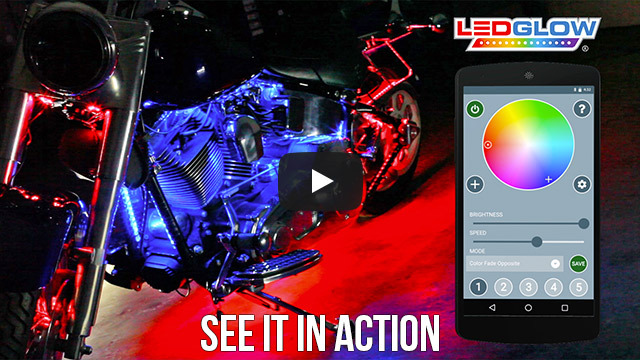 LEDGlow’s Advanced Million Color Control Box Upgrade allows you to control all of the featured colors and lighting patterns directly from your iOS or Android smartphone device. This control box upgrade is compatible with the Advanced Million Color Motorcycle Kit, Advanced Million Color Mini Motorcycle Kit, LiteTrike® Advanced Million Color Kit, Advanced Million Color Pod Light Kit, Advanced Million Color Slingshot Lighting Kits, Advanced Million Color Dirt Bike Light Kit and Advanced Million Color Snowmobile Light Kit. Happy with the product. Easy install and love the brake feature. I hope that you guys will come up with something for the wheels as well. Thanks for a great product and keep up the good work. I keep buying these things - they're addictive! Easy to install, the smartphone app works fine. The brake feature (with all the lights turning red when using the brakes) has become a dependency - I think it's an important and useful feature. Love the product. Simple as that. Plus the brake light option is fantastic pulse and solid which is another plus. This is the most flexible controller at any price. And it's plug and play. I went through a couple of the BT controllers that are touted on the net, but this one delivers what others promised and then some. I'm now rethinking how I want to set-up my bike with the dual zone lighting and the auto brake glow is a super safety measure. If you're going to "light it up" this is the controller you want. And if you already have installed comparable LEDs, this is the upgrade you need.